Okay… so I do judge books by their covers. Truth be told, lots of us do. So many, in fact, that Borders are now rearranging all their book stores to show more covers even though they’ll take a hit on how many titles they can carry. I’d been hearing good things about Patrick Rothfuss, and his first novel, The Name of The Wind packs a list of blurbs both admiring and credible — blurbs from authors I admire — as long as my arm. I read the excerpt on Patrick’s web site. I liked his humor… what’s more I liked the story. I place an order at Amazon and they ship me… this. And I can’t help but think something has gone terribly, terribly wrong. This isn’t the book I ordered. That one had blowing leaves, and a stone man’s face and mystery and… dignity. It didn’t have a shirtless, I-want-to-be-Fabio-when-I-grow-up red-headed step-child on the cover. It didn’t look like an overripe romance novel. 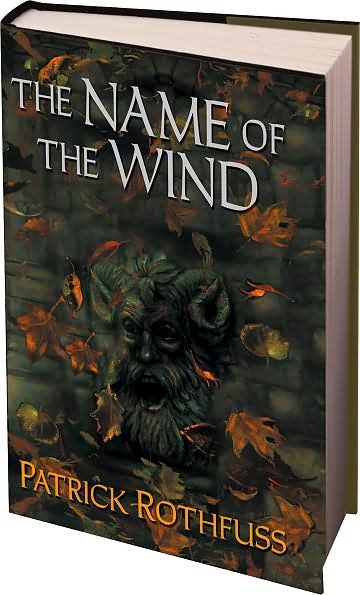 As for the author, I imagine Patrick Rothfuss has neither time nor inclination to be particularly mortified by this cover… The Name of The Wind is in its fifth printing — and its third cover. And the book? Despite the cover, it’s quite a good read. I’d love to have a word or two with Patrick on how it came together; there’s bits and pieces here and there that strike me as a bit out of joint with the story — perhaps the result of editorial fiat — but it’s first and foremost a really solid bit of storytelling and an impressive feat of world-building. It’s a high-fantasy novel, yes, but one anchored by solid rules: magic — the unruly and unbalancing bugbear of many a tale — has costs, and consequences. Final assay? An annoying cover. But a good read. Related: What kind of input to authors have to their cover art? Depends. Here’s one author’s point of view. I wonder why publishers change the look of successful books. I had a similar problem buying the complete Aubrey/Maturin series by Patrick O’Brian. After a search of several book stores and at least two different eBay purchases I finally had the full twenty book set in one style. Or so I thought – when it came time to read the 18th book it was missing, I only bought nineteen of them. Since I was reading an older printing I ended up with one book with mismatched cover art and different dimensions. BTW, if you want to read them I’ll sell the set cheap.